When visiting 99 Ranch during its peak hours, I make it a habit to make my visit there as quick as possible. Any regular patron will know that parking on the weekend is always a test of your patience and inside the shopping area can be just as crazy. I read about E & Drink a while ago but eventually forgot. The sign advertising snow fluff probably drew me in. Once inside, the picture with an egg waffle caught my attention. I’ve been wanting to try egg waffles (a.k.a. 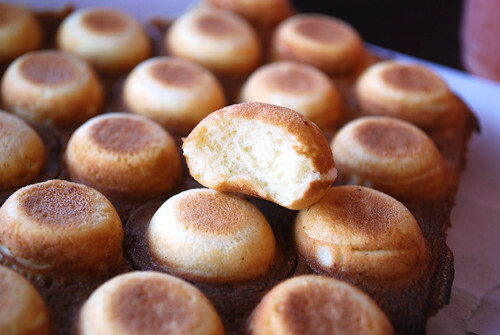 eggettes or bubble waffles). They’re a popular street food in Hong Kong. I’ve considered buying my own egg waffle iron but considering how infrequently I use my regular waffle maker, it would probably sit in the pantry after a few initial uses. 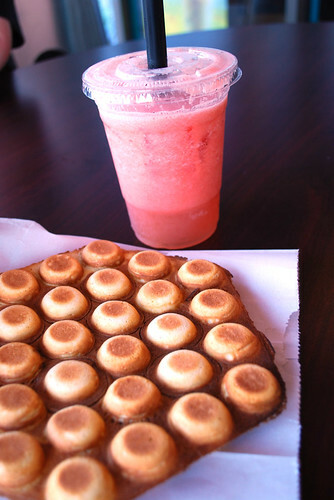 An egg waffle ($2.99) at E & Drink is lightly sweetened and doesn’t require syrup. Waffles are made fresh in the back and arrive in a paper bag folded in half. Unlike regular waffles with square indentations, cooked spheres are connected with a thin sheet of batter that make it easy to break off individual pieces to eat. Paired with one of E & Drink’s beverages (their watermelon drink is good but is so easy to make at home), it makes a nice snack that you don’t want to share. I don’t know if this is an authentic egg waffle (some photos I’ve seen look to have almost hollow and transparent bubbles) but I’m looking forward to tasting more. This seems like it would be the perfect snack to eat while going up and down the aisles at 99 Ranch. I’m more of a get-in-and-get-out grocery shopper, but T loves to browse everything at asian markets. I think it’s all so new to him, he’s still fascinated. Haha! I like that you think the same way as me. The sooner I’m out, the better. I don’t really like the version at E&Drink. The other ones I’ve had (though I’ve never been to HK either) are lighter and fluffier and taste a little like those cookie egg rolls. 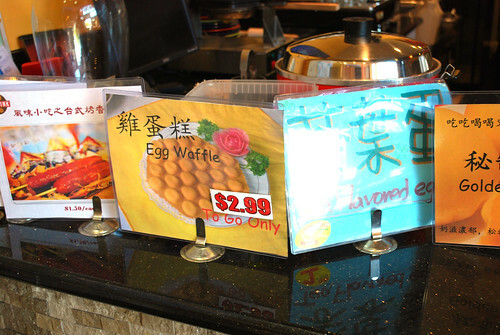 There are several shops in LA that offer egg waffles and in many flavors, but I haven’t yet had a chance to try any of them out. I think I would prefer one with another flavor. I guess it’s time to start looking! M.I. 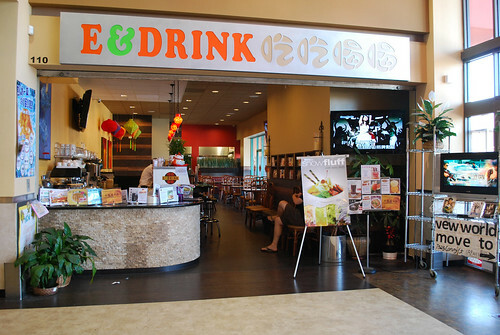 Tea Express actually offers egg waffles now, too. The version there is much better than E & Drink’s! 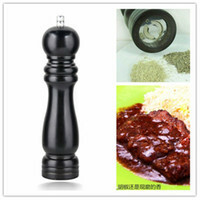 Thanks, Jinxi! I’ll put M.I. Tea on my list to try next time. I’ve had the version at E&Drink and another one at Eggette’s (in SF’s Sunset District). E&Drink’s waffle was a bit softer and fluffier and only comes in one flavor. 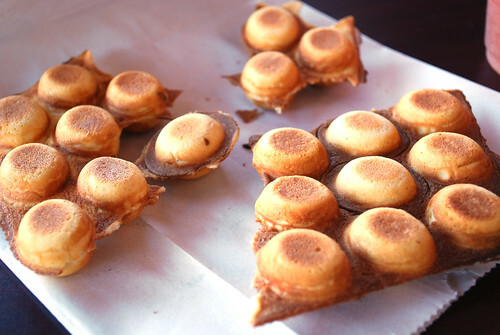 At Eggette’s, the waffles come “curved” and break apart more easily. They are also more “crisp” and come in coconut, regular, and chocolate flavors. I liked Eggette’s better but having seen Jinxi’s comment that M.I. Tea Express is offering it, I’ll try it there too for another comparison. Ooo! Thanks for clarifying it for me. I’ll put Eggette’s on my list next time I’m in San Francisco. If you go to Eggette’s, it’s fairly close to Polly Ann ice cream, another SF favorite. If you choose to do so, you can spin a giant wheel of flavors and whatever the pointer lands on (on the flavor or to the left and right of the actual flavor) is the ice cream you get! I didn’t do the wheel because I didn’t want to end up with a wierd flavor!